All I’ve been wearing for the last month is strappy dresses, sandals, shorts, and t-shirts. That’s my idea of summer – lazy, breezy, no-fuss. In the midst of another 90 degree day, it’s hard to even imagine the crisp sweater weather ahead. I mean, ugh, who wants to think about layers in the middle of July? In fact, let’s be honest, most of us don’t even think about sewing that much when it’s hot. We’d rather be outside, or eating ice cream, or… anything other than standing next to a hot iron. But planning ahead for the next season is probably the number one thing I can do to get my sewing organized. It helps me think more strategically about my wardrobe as a whole. With a little distance, I’ve found that I can develop a better game plan for what I really want to make and wear, not just what feels good in the moment. It also helps me to evolve my style over time, and gives me a chance to look back at the previous seasons. Each season, my mood shifts, but I also feel like I understand my tastes and where they come from just a little bit more. I decided July would be the perfect time to get a head start on my own wardrobe plans for the coming season. If you’re in the southern hemisphere, you can do the same for spring. Here’s what I did to get a jump start on fall. Feel free to follow along, or adapt these ideas for yourself. If you’re new to the idea of wardrobe planning, take a look back at year one of the Wardrobe Architect series. 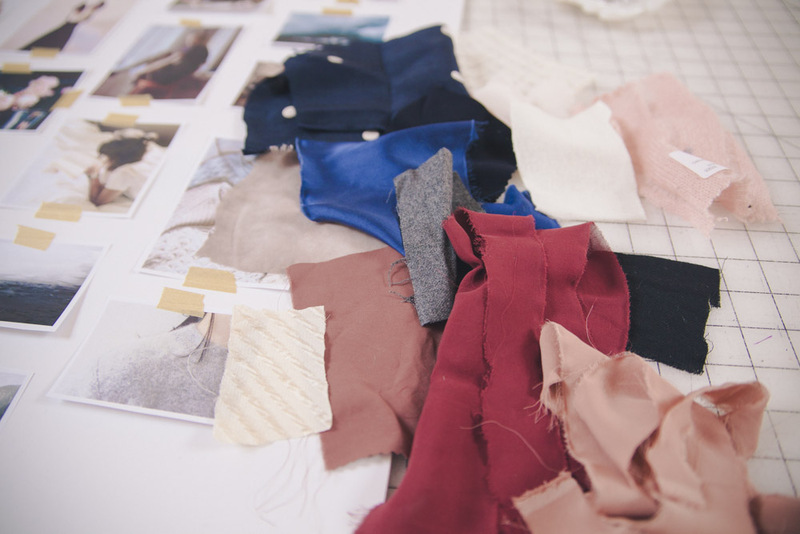 We went over ideas for creating a core style, developing a palette for yourself, and finding the shapes and silhouettes that suit you. I’ve found the most helpful thing is reviewing the words that describe my core style, and looking over my style moodboard. From there, it’s a matter of reinterpreting those words and moods into the present moment. I like to create a moodboard for each new sewing season. I use my existing core style moodboard as a starting point, adding and subtracting images that fit my life and the season. I see this as a way to evolve my style over time and bring in fresh ideas, while remaining true to who I am aesthetically. You can use Pinterest for your seasonal moodboard, of course. This season, I decided to create a physical moodboard. I was inspired by some of the physical boards Christine has been creating for our photo shoots here in the studio (more on that in a later post). I found that creating something physical was a very different process, and helped me to make some interesting choices. I found myself gravitating more towards images that were about mood, environment, and context rather than straight-up fashion inspiration. My board is a bit of a snapshot of how I see the next season unfolding, more than anything else. I also found the end result much more inspiring to look at and take in at a glance. The fact that it was pared down to 20 or so images helped me to create more of a story. I especially like that I can add swatches to it, pulling from the fabric that I already have to inspire me. 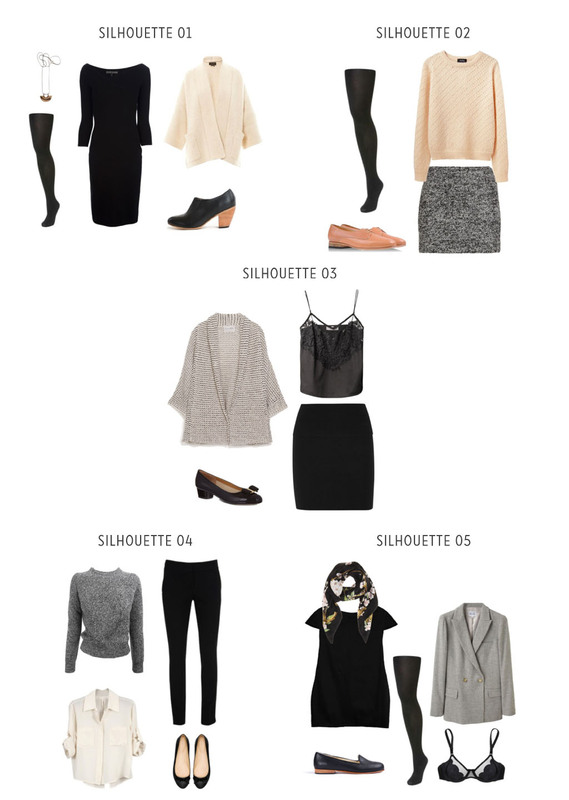 Next, I picked out a few silhouettes I know I’d love to wear a lot this fall. These silhouettes are basically outfit templates. They’re the shapes and combinations that I’m certain I’d get a lot of mileage out of. While I can add in a few bonus pieces that are a little more experimental later, these are the kinds of shapes I want to absolutely live in 90% of the time. The silhouettes were inspired by the moodboard I created, and also what I’ve worn and loved in the past. For example, I know that I love to wear short shift dresses and tights, fitted knit dresses with a big warm sweater coat, and cropped sweaters with pencil skirts. Using a combination of my moodboard and the core palette I created last year, I pulled out the colors for this fall. I picked out a combination of neutrals, semi-neutrals, and statement colors. My wardrobe heavily skews towards the first two categories, which allows me to have less clothing but lots of versatility. I like to get variety in terms of accessories and textures, but I do try to pick out neutrals and semi-neutrals that are still really pretty to me. That’s just my own preference. If you prefer plenty of color and pattern, go for it! Some people make do with hardly any neutral clothing at all. At this point, I added a few more swatches to help me start forming a plan. Now that you have your outfit templates and your colors, you can start making a list of the project you want to tackle this fall. I try to be realistic about this. How many pieces could I reasonably sew in the next 2 or 3 months? I decided to try sewing 10 pieces, including some quick-and-easy weekend projects. You might be able to sew 20 things, you might want only 3. I’ll talk a little more about this next month, as I start narrowing my choices and coming up with specific projects with patterns and fabric. For now, I have an inspiring visual to put up in my sewing space, and lots of ideas that have me ready to start hunting for wool in July. Looking over my plans for last fall (2014) and comparing them to this season was really interesting. My tastes haven’t changed much, but each time I run through these exercises, I seem to understand them a little differently, or discover something about myself. For example, I’m increasingly drawn to soft and comforting textures, things that are touchable and warm. I like moodiness and dark florals and natural colors. I like gold and bronze jewelry that looks ancient and modern (I call them “cleopatra jewels”). I like touches of lace. Each of these says something about who I am, my personality, my history, where I live, even my family. Sewing really can be a window into how you see yourself as you grow and change. Have you started planning your fall sewing yet (or spring for those in the southern hemisphere)? When is your ideal time to start thinking about the upcoming season? And if you post about these exercises on your own blog, feel free to leave a comment and share that here! It’s fun and edifying to see how others plan their sewing. Wardrobe Architect – Plan Your Sewing! I am new to sewing. I recently purchased your sewing book and reading the blog. Having clothes that fit became the main reason to start making my clothes. Thank you for creating this blog and patterns to give women more choices of a wardrobe that fit their style and bodies. I haven’t even finished making all I wanted for the summer, and now we’re already planning for fall!? I don’t want the summer to end! I’d better get cracking. Haha, I know. I still have summer things I wanted to make, but I figure if I start on fall now, it’s less likely I’ll feel the same way in November! I’m going through this process now and thought I was the only person crazy enough to plan out coordinating pieces to make my own little capsule! I just finished a fit and flare dress in hunter green plaid (which I lined with flannel because I am always freezing). I’m currently making a matching solid green peplum blouse with a peter pan collar and scalloped hem (I just checked out your tutorial and it totally helped me figure out how to do it on the little clutch I made to practice). Next up I plan on making some little jackety thing in the plaid. 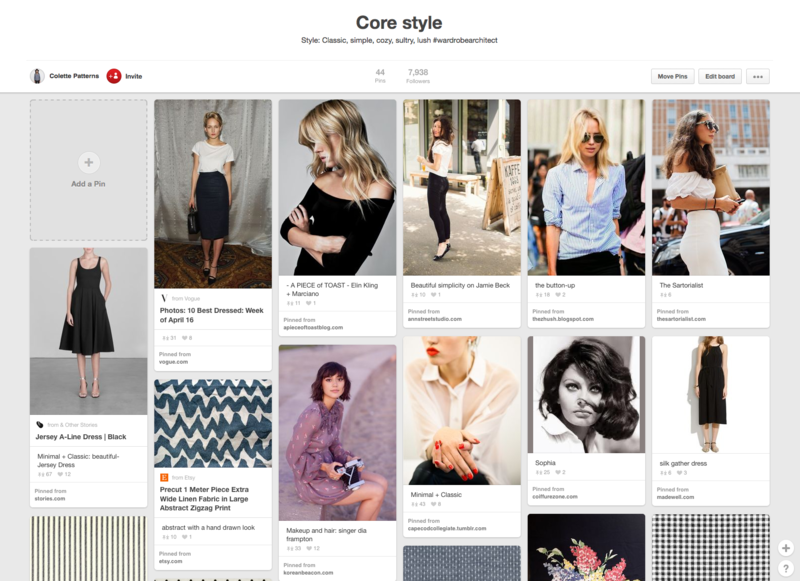 I’m so inspired by your mood board! I LOVE these posts. I read it, and think along the way, “yes, get out the notebook, make lists, get the floaty ideas out of my head and in an organized fashion so I can be more efficient.” I apply this to work and family, and now sewing. Thank you. Yayy! I am a beginner and I am planning my first capsule. I have my patterns ready. I intend to learn how to sew all of them: 4 bottoms, 2 dresses and 3 tops. I have collected fabric for each one and enrolled in classes, in person and online to tackle them. I am so excited. Thank you so much for the inspiration and support. After finally realizing what a mess my wardrobe was, thanks to WA…I’ve decided to spend the rest of 2015 working from the inside out! Bras, undies, and slips will be all I sew for my wardrobe the rest of this year. It’s very liberating! What’s the point, really, of trying to make tops if I’m not even wearing the right bra, or a dress if I don’t have appropriate slips? Plus, right now…very little ironing necessary in my bra-making. Yesssss. Just love this newsletter, so informative, haven’t done any sewing much since my grandsons needed christening outfits, when my kids were little I made all their clothes. Your site is encouraging me to get out my patterns, fabrics and sewing machines again, and updating my wardrobe is a must, now I am in my 70’s and still want to look stylish and with a small clothes budget, Hurrah, with your mood board ideas I can do that sewing again and update my techniques, Thanks so much for your help and ideas. I make clothes for the next season but usually because I have just bought last season’s fabrics on sale! WA is a better strategy, of course. It eliminates making random items that don’t go with one another. However, even as an intermediate sewer, I am still learning, plus my body has changed a lot over several months, that I don’t feel as if I need or even should impose this kind of discipline, at least not until I get better at my techniques and more accurate with fitting. In the meantime, I don’t want to deny myself the pleasure and therapy that I associate with my favorite hobby, and do not feel the need to wear everything I make all that frequently. I think if I get very good with a dozen or so core patterns, I will have enough confidence and skill to then plan more diligently, and be more likely to stick to the plan. I hope this makes sense. As a final thought, I have come to realize that because I do not wear any jewelry (too lazy? Just not a jewelry person?) I lean more towards pattern and texture in my fabric selections than what you have chosen for yourself here. Lovely pallet though! I used to wear barely any jewelry, just my wedding ring and a ring my mom gave me when I was 18. But I’ve fallen in love with jewelry in the last few years and wear more and more of it. So funny to read this email today because I have been thinking about this all week long – just started back sewing to make clothes that actual fit me and are what I want and looking for. Have been ordering swatches like crazy and planned to start this weekend pull out patterns and swatches and decide what I want and need in my core wardrobe – I really have nothing right now after a major clear out of my closet – so I will be starting from scratch and building from there. I love fall so I am really excited to plan and sewing things that I know I will love and wear often. Planning to do lots of mixing and matching and working the colors I want too. Thanks Sarai. These Post are super helpful to me. But they also remind me that I planned to make at least 3 wardrobe staples for summer but still haven’t finished the first item. 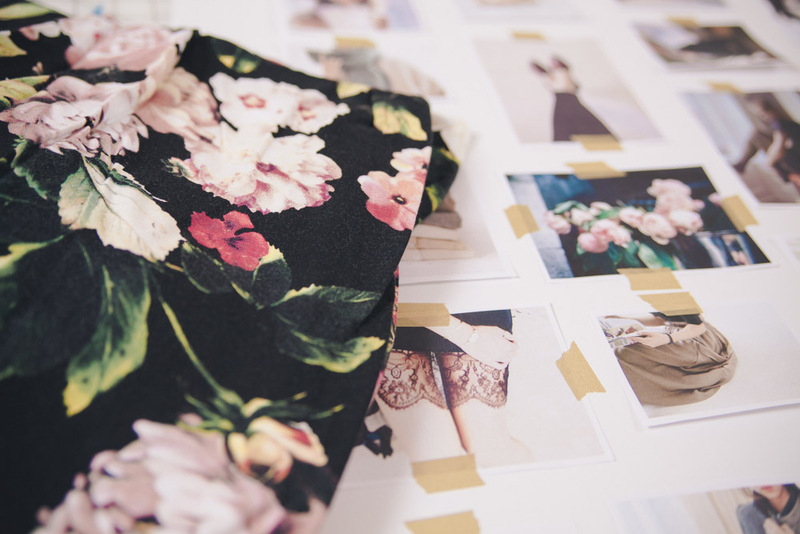 Do you remember where you bought that georgeous black floral fabric ? I fell in love with this print. And it is totally autumn appropriate. You guys are so awesome! I love reading about how so many are already planning fall WA! It’s one of my favorite times of year- northeast Ohio has such amazing leaves. Probably this is why my fall wardrobe has so many holes in it…I’m out enjoying the scenery! Thanks for the inspiration, everyone! I just finished a halter top so I’m obviously still deep in my summer sewing, but maybe I should get into my stash and think about some of my fabrics for cooler weather. A little advance planning goes a long way, right? I have a love-hate relationship with this post, Sarai. I LOVE that it reminds me to put fall sewing on my mind now versus waiting for that first temperature drop to frantically sew up a goosebump-fighting Astoria. But, I HATE that I feel like shmuck for still having summer makes in my queue. However, to fight off the shmucky feeling, I just made a sew-now-or-fugggitaboutit list inspired by your example of letting go. So, we’re good ;-). Haha, I’m glad we’ve settled that! As I have just started doing what I call “everyday clothes” sewing for myself and a bit for my family, I am starting to switch to more fall or year round items. Since I overheat very easily, I can see myself wearing tanks year-round with a cardigan or flannel shirt/tunic over them. Getting the fabric is the hard part as I am low income (part of why I am trying to sew more). It is hard to build a stash, so I keep waiting for 50% off coupons and try to do a project a week. I am not sure I would want to do more than that most of the time, as I have other things I need to get done and other crafting I love to do. That is what I am starting to do more. What are things I would wear with anything? I am also working on the little bit of stash and making PJs. That has been a ton of fun and I can see myself wearing some of these year round. Thanks for the idea though. I hadn’t thought about of year round colors. 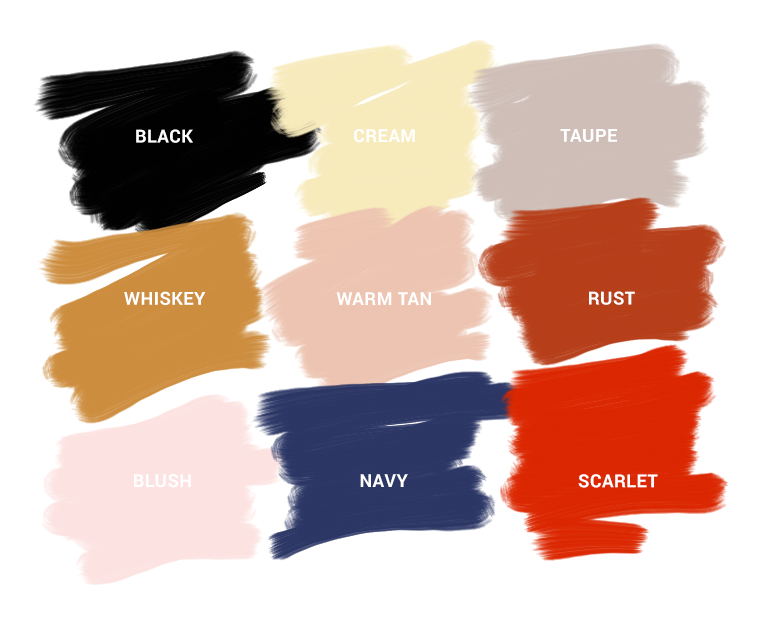 They are mostly neutrals with red and what I call true blue added in because I can see myself wearing those year round. Also denim is in that group because denim is a neutral for me. wow! I don’t think I noticed how nice blush and navy look together until I noticed your color swatches. I like navy and it is a good neutral for me but I have trouble making it work for me. I think blush is a great start. I am inspired to start my own mood board. Thank you. I LOVE sewing but unfortunately I’m not taking it for GCSE so this has given me some great ideas and ways to plan fro my next fall wardrobe as well as being abelt o some sewing at the same time! I’ve started planning my winter wardrobe as well. My mood board is on Pinterest and my palette is here. I made a wardrobe capsule for the first time this year. It was a real eye opener! It wasn’t easy to do, but it sparked creativity, got me sewing and I now have a lovely summer wardrobe, that suits my personality and life style, that is easy and fun to wear. Thank you, Colette, for this series! 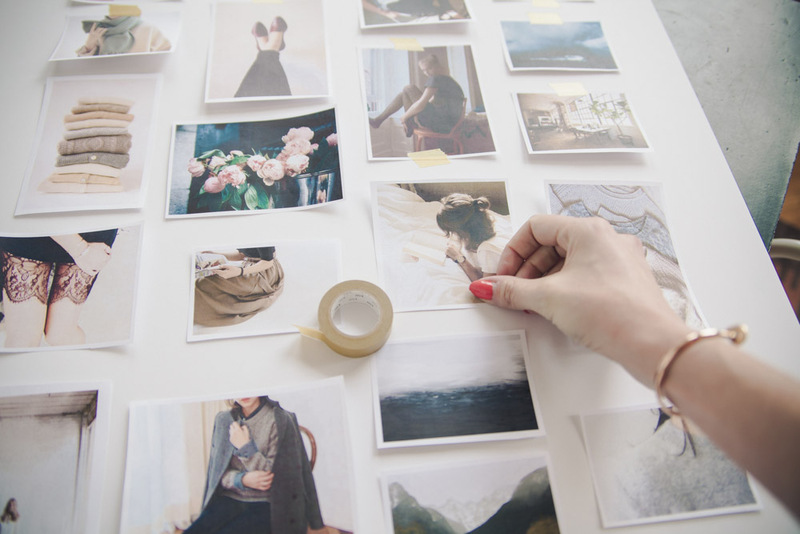 I’m going to pin the heck out of your mood board- it’s great! What happens when you have a disconnect between your lifestyle (SAHM) and the styles and silhouettes that you favour and make you feel good about yourself? How do you balance practicality with wearing clothes that make you feel like ‘you’? Love this post! I love to sew and am determined to be better at planning than just sewing garments more on a whim. I think spontaneity is great, but a plan is also good. 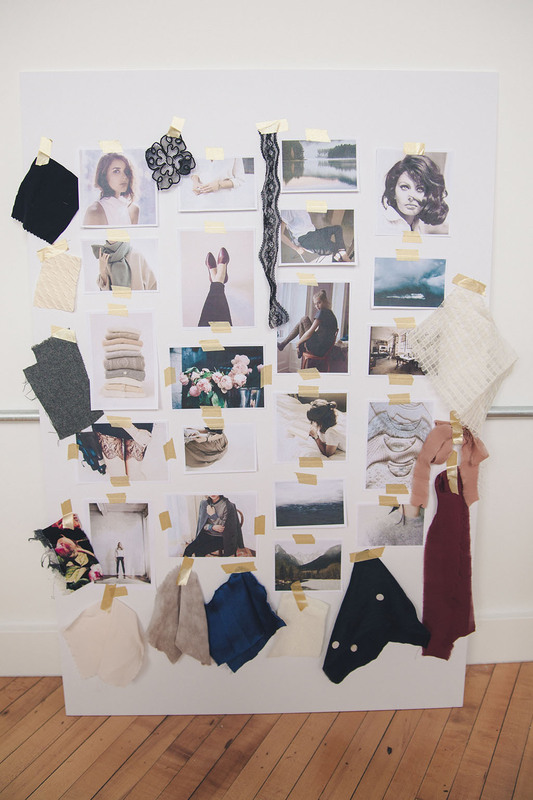 Will you give more detail on your mood board. I would love to have that in my sewing room for inspiration. What is it made from. Ready for my plan! I could step right into your wardrobe. This is the first time that I have thought ahead in sewing terms or even thought about what I wear constructively. I want to experiment with different colours and fabrics although I am a strictly natural fabrics woman with a little bit of man made. I’m lucky enough to be able to wear most colours but I’ve languished in the safety of safe black, blue and sometimes brown as a main staple. It’ll be interesting for me to see whether I can think outside the box and lose the safety blanket. I am in Utretch on a short break that ncludes (the main reason really) visiting the huge fabric market. I have bought Colette Sewing hand book to make the 5 fundamentals and the Bettine pattern . I plan to let the fabric choose me & and sew up a work wardrobe in the last two weeks of my summer break. Other than casting my beady eye over garments everywhere that’s it. After reading this big. Need to be a little more organised,, or end up looking like I hav been in the dressing up box! So I have figured out my color palette–My uniform that I am most comfortable in is Indigo, White and Gray. My main neutrals are Black and Brown and my accent colors will be Red, Purple, Mustard Yellow and Emerald Green. Your choices have truly inspired me! Every silhouette would be good on my shape and the colors as well! I’m tall and curvy so I tend to stick to basics. I sew extensively for granddaughters but never for me. High-time Zi started and honestly this post is a catalyst! Is there a Colette pattern that would create a dress similar to the black one in your Silhouette#1? I have quite of few of them…bought with good intent, need to get on it and thank you! I love your clarity and creative process!